Sirk's favorite leading man and Daves' principal star. Round 2 - Delmer Daves did a masterful job of integrating story locations into his films. The most lasting image from A Summer Place is of Troy and Sandra Dee holding each other passionately on the beach... desperately in love, aching to be together, trying to find a secret place to be alone...as the ocean splashes on the shores (OK, it's not From Here to Eternity, but it's still memorable). Likewise, the New England tobacco fields in Parrish and the stunning California coast of Susan Slade enhance these tales of young love. In contrast, it seems like the settings are incidental in Sirk's films, with the possible exception of Written on the Wind (and even then, most of the action takes place indoors). Susan Slade: An example of Daves' integration of location. Round 3 - Douglas Sirk used film like a canvas, skilfully employing color, framing, and objects to enhance character traits and themes. 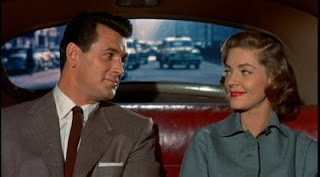 In Written on the Wind, Lauren Bacall's conservative character sports a wardrobe of muted colors while the "bad girl" (Dorothy Malone) drives a bright red car. 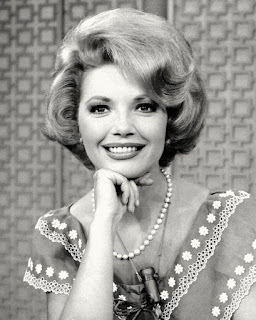 At the end of the film, Malone's character--who has lost Rock to Lauren--clutches a phallic model oil well in her office. Delmer Daves' soaps are lushly photographed, but the nod here goes to Sirk. Hudson and Bacall in muted colors in Written on the Wind. Round 4 - No soap director used music better than Delmer, but then he had a great composer come up with great themes: Max Steiner's Theme from A Summer Place is still the best-selling instrumental of the rock'n'roll era and I'll never understand why Steiner's equally melodic love theme from Parrish seems to have been forgotten. Sirk, on the other hand, frequently employed Frank Skinner, whose scores ranged from lush (All That Heaven Allows) to mush (Magnificent Obsession). Round 5 - Sirk's admirers claim that his soaps are rife with subtext: All That Heaven Allows is an indictment on social conformity; Imitation of Life takes aim at racial inequality, etc. 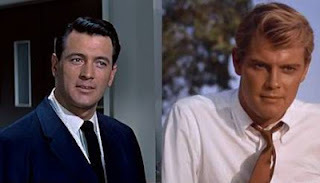 Of course, one could make similar arguments for Daves' films: out-of-wedlock pregnancies play a key role in Parrish, A Summer Place, and Susan Slade. In the latter two films, the teenage mothers become social outcasts (societal conformance is so strong in Susan Slade that the pregnant girl's mother passes the child off as her own!). This is pretty much a draw, but I'll give the edge to Sirk because his films have garnered more documented critical acclaim--and even got the Criterion treatment. Grant Williams worked for both directors. If you've followed my scoring of this fight, it's three rounds to Delmer, two to Doug, and one tie. The winner--by decision--is Delmer Daves. He's now the undisputed "King of the Movie Soaps." It's a title he has long deserved. Anyone interested in staging a rematch? If so, I'd love to hear your thoughts. I can't ... I can't think of Daves as King of the Movie Soaps. He's the man who gave me "3:10 to Yuma" and then there's everything else he ever did. I can't even think of Sirk as King of the Movie Soaps. I like his Americana-lite stuff such as "Take Me to Town" and "Meet Me at the Fair". I'll agree you make a lot of sense in your arguments and am even willing to concede that Daves offers the much lauded Sirk heavy competition. But there is nothing else for me to do but pour a stiff drink and watch Ben Wade and Dan Evans. Delmer "3:10 to Yuma" Daves, King of the Soaps. How did it come to this. CW, I may be in the minority, but I'm a huge fan of the "movie soap" genre. I have friends who hate the term, but I think it's appropriate for movies like IMITATION OF LIFE and A SUMMER PLACE. They're still fine movies! I hear you. I like my soaps as well. A nice, grand emotional story hits me where I live. It's just that I'll always reach for the western first. PS: One Sunday I spent the day with a double bill of "Bend of the River" and "The Tall T". My hubby was in the rec room watching "A Summer Place" and "The Help". Daves also did some terrific westerns (THE HANGING TREE, DRUM BEAT, WHITE FEATHER) and that mini-epic DEMETRIUS & THE GLADIATORS before hitting the sudser trail, but yes I love those early 60s movies of his - ROME ADVENTURE, (LOVERS MUST LEARN here in the UK) is another marvellow wallow, with Troy and Suzanne Pleshette and Angie Dickinson and Constance Ford again, in a curiously empty Italy - where was everyone?, did they shoot every scene at dawn? 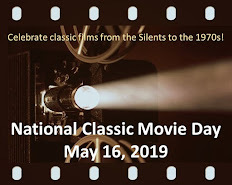 - and I'd like to see his BATTLE OF THE VILLA FIORITA also in Italy in 1965, with Maureen O'Hara heading, and it was a delight to finally see his 1964 YOUNGBLOOD HAWK recently, now available at last, with teak James Franciscus in the Troy role, and good roles for Suzanne Pleshette and French Genevieve Page. and Mary Astor, with great black and white images. A SUMMER PLACE is one of the great hits of 1959, like THE BEST OF EVERYTHING or PILLOW TALK or Sirk's IMITATION OF LIFE. THE HANGING TREE is one of my all-time favorite Westerns (great title song, too). I think Troy and Suzanne got married shortly after ROME ADVENTURE, though it didn't last long. I also just saw YOUNGBLOOD HAWKE recently and enjoyed it. BATTLE OF THE VILLA FIORITA is high on my "wanna see" list. Michael, you obviously have great movie tastes! A lot of these movies I saw as an impressionable teen at my local theater - thanks for the reminder, Rick. But I must say that I never liked Troy Donahue in the slightest - I mean, huh? He was such a sleep walker. Rock Hudson really wasn't much better except occasionally, both these guys had that weakness of bad movie actors: being seen trying too hard. But of course Rock was a bit better than Troy who didn't even know how to speak correctly on camera so that he sounded normal. Robert Wagner had the same affliction though he got better eventually. I loved ALL THAT HEAVEN ALLOWS though - it's my favorite soaper of all time. The rest of the films mentioned (in the soap category)I could easily do without. I did love my westerns though. WHITE FEATHER, now THERE was a movie. P.S. I loved FAR FROM HEAVEN, a wonderful homage with much better actors than Sirk or Daves ever had. I'm a big fan of the "movie soap" genre too, Rick. I really enjoyed several of Douglas Sirk's movies, and Peyton Place is another one of my favorites that comes to mind. I have to admit though that I've never heard of Delmer Daves. I'm really interested in checking out his work now though, so thanks for the reference! You have reminded me of one of my very favorite films, A Summer Place...Delmer daves does indeed deserve props for that beautiful film. Parrish, not so much, despite the presence of the great Claudette Colbert. Susan Slade, I have never seen. I'm a big big Sirk fan here, though, and my two favorites are All That Heaven Allows and of course, Imitation of Life. Rock Hudson is a wonderful actor, but I think John Gavin is even handsomer than Rock or Troy.